Well, now back to normal! After all my waffling about the Eurovision Song Contest last week, I can now return to my random ramblings about me, and my take on things in my life. I’m on holiday from work this week, and rather than do my usual ‘nothings’, I’m planning on spring cleaning my flat. I mean my upper-level apartment. Well, that is when I get round to it! I’ve decided not to start it today (well, it is a Bank Holiday) and opted to do nothing instead. I’ve just looked out of the window to see what the weather is doing, and it doesn’t look too bad – bright but cloudy, so it’s fine. It would still be fine if it was raining though – we can’t do anything about the weather apart from moan – it’s too hot; it’s too cold; it’s too wet; it’s too windy. Well, I’ve decided I’m going to use the phrase ‘it just is!’ no matter what the weather is doing from now on, and just enjoy it. That way, with the Law of Attraction, I’ll be bringing more things to myself to enjoy and less to ‘moan’ about. Yes. Spring cleaning. My plan is to do each room in turn, quickly. As quickly as I possibly can. I’ve only got five rooms, so it shouldn’t take that long really. I can see myself sitting back when it is all done, congratulating myself on a job well done. That’s my intention. All I need to do is actually make a start. I’ll make a start tomorrow. I have a tendency to put things off, which can be a problem. I really need to do some exercise to make my body fitter and get more ‘in shape’ so my clothes fit better, and I feel better. I like to go swimming, and when I actually do go, I work really hard and really tone up my body in a very short time. Swimming works wonders for me, but I have to get round to going. Once I have started, there is no stopping me – I go every day and push myself to beat yesterday’s number of lengths swam in the pool – the last time I went, I got up to one hundred lengths in 30 minutes. I don’t know whether that is good or not, but it is good for me. And the weight literally drops off me. I know all of this. I know swimming is good for me. I enjoy swimming. I just never manage to get around to going. I really need to put my intentions into action. I do at times (I’d intended to start this blog months ago, but only got around to starting it this month) but need to act more often. Like with the weather, I intend to enjoy whatever I do – but I can only do that if I actually do it! Thinking about, or writing about, spring cleaning or going swimming isn’t actually getting it done… the idea’s there, I know that I can do it, I just need to put my ideas into action and reap the benefits from them. I have faith in my abilities to do what I want to do. I just have to start. Today’s the day! I’ve had my wine chilling in the fridge, and just need to get some chocolates and strawberries and then I’m ready for the best song contest on the whole planet! In just a few hours, we’ll know this year’s winner. I wonder if it will be one of those I’ve highlighted above? Even if it isn’t, it will still be a good contest. And I’ll get to see this year’s scoreboard too! Call me sad, but that is another of my Eurovision favourites – how the scoreboard will look! More later! It only feels like last week! 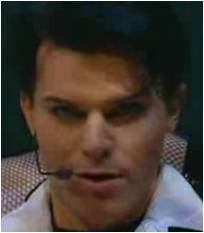 The Eurovision has entertained me for many, many years. 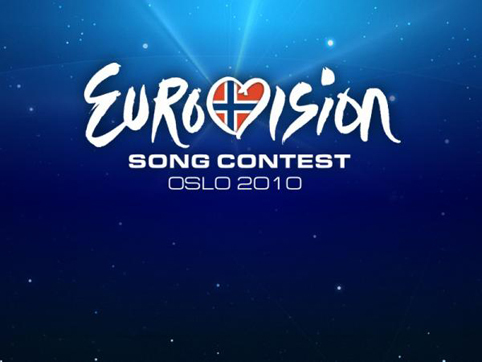 It has been running longer than I have been in this existence, and now, with the magic of the internet I can find clips of all of my favourite Eurovision entries. Some of the really old ones, from the days when TVs were mostly in black and white, aren’t included here, for two reasons. 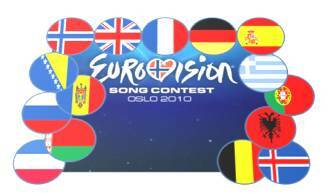 Most of the Eurovisions I remember were in colour, and although I like some of the songs from the early days, I didn’t see them performed live. These songs listed here are from shows that I watched on my (or someone else’s) colour television set. They also aren’t in any order. I just thought I’d mix them all up and put them all out! 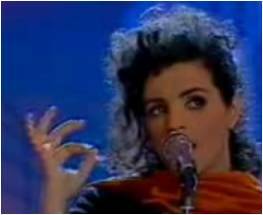 First out of the hat, from the year 2000, is Claudette Pace with “Desire”, for Malta. It didn’t win, but it is a bubbly little number! 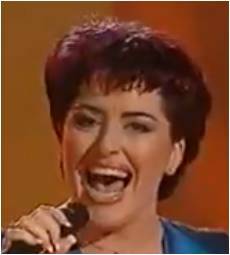 Waaay back, in 1991, France entered the contest with Amina singing “Le Dernier Qui a Parlé”. A song that has travelled through time with me – it’s very unusual, but very good. I was humming it this morning! And thinking about it, 1991 isn’t really that long ago… is it? 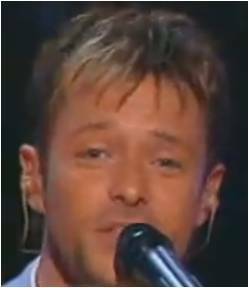 Jumping forward slightly, to 1994, Frances Ruffelle represented the United Kingdom with “Lonely symphony”. I find this song to be very anthemic. Three songs now from 1998: from the UK, Iceland and Russia. And the UK won! Katrina and The Waves “Love Shine A Light”; Paul Oscar “Minn Hinsti Dans” (must be seen!) and Alla Pugachova “Primadonna” – I really liked this one! Last year’s contest had four songs that I had to play over again. Iceland’s Yohanna, “Is It True?” goes without saying that this is one of my favourite songs of all time! And I love the way it was staged in Moscow. Absolutely stunning! Portugal’s Flor-de-lis with “Todas As Ruas Do Amor” is another happy bubbly song. And last year’s winner, Alexander Rybak for Norway, with “Fairytale” ‘I’m in lurrrrve with a fairytale…’ OK, I’ll not sing. 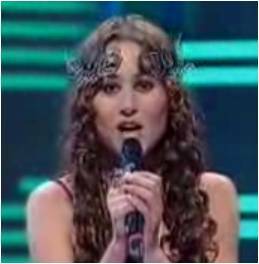 The fourth of my favourites from last year is Chiara who sung “What If We” for Malta. This is the song that features the line “If you don’t know your destination, who determines your destiny?” Quite a valid statement, if you ask me. Back to 2000 again. Russia entered this year with Alsou singing “Solo” I have to ‘do the dance’ with this one. Love it! 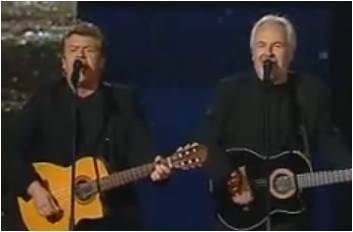 In 2004, James Fox represented the United Kingdom with “Hold On To Our Love” A good song I thought and should have come higher placed than 16th. In 1994 Germany asked MeKaDo to sing “Wir Geben ‘ne Party” and got me boogying! 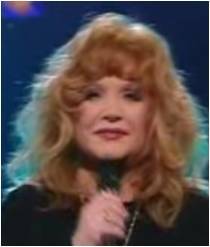 Gina G’s “Just A Little Bit” appeared in the 1996 contest, for the United Kingdom. And there we have it. Fifteen or so of my Eurovision faves. There are more. Many more. Far too many to write about here. I’ll see if I can add some videos one day of some of the songs, but until then, have a look for them on You Tube. They’re not to everyone’s taste, but I like them. I do enjoy my travels through time 🙂 ! Wow! What a first semi-final! I found myself caught up in the moment and tapping along to some of those tunes! And I’ve got it all to come on Thursday! Speaking of Thursday, I was in a bit of a rush earlier, and posted Thursday’s line up instead of tonight’s! Oops. Never mind! All sorted now! And we’re through! Well, Iceland is! Through to the final on Saturday. In a nail-biting finale, Iceland was the last of the ten winning countries to be revealed, which is exactly as it happened last year when Yohanna represented them. The crowd were cheering and shouting for Iceland then, too! I’ve also decided on a couple more favourites. More tomorrow! I have an electric clock with a thermometer on it. This morning (just after 10am), it is showing the temperature as 26.5c, 79.7f. OK, that’s the temperature inside, but it looks very warm outside. 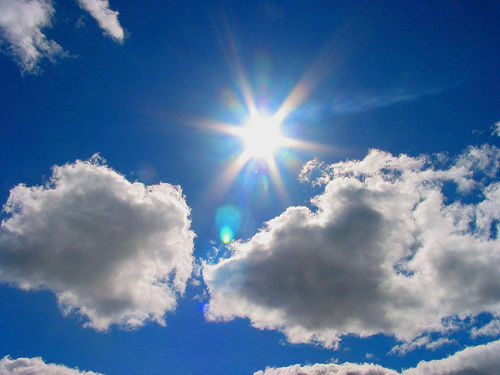 The sun is shining brightly, the birds are singing loudly, and there isn’t a cloud in the sky. I feel like bursting into song, but will resist the temptation, given my singing qualities aren’t the best. Besides, a baby is screaming for something outside, and I don’t want to compete with that. I like the way everywhere looks in glorious sunshine. Everywhere is crisp and clearly defined. The colours are vibrant, the sky is one of the best shades of blue you could ever imagine, and the greenery of the plants and trees all blend perfectly together. The birds seem to love the sunshine, singing away, as though they are in competition with each other. And probably they are, but they make the competition sound good. Cats have the right attitude when it’s hot like this. They find a nice place in the sun, and flop down. Groom themselves slightly, turn around, and flop down again. Move to the shade when they get too warm. Groom again. Flop down again. They do just what they want to, when they want, and seem very content to do it. Humans seem to have taken to cooking outside when the sun is shining. Everywhere you go, you can smell someone’s barbecue just being started. It’s a bit early in the day at the moment for barbecues, but hundreds will start before long. Most people sitting outside, usually in the shade, having a few drinks and some scorched barbecue food. I like a good barbecue myself, I must admit. Just don’t ask me to do any cooking – that is not one of my strong points, although it won’t take long for me to learn. (Have a read of ‘my’ first Secret Teachings post regarding the value of an hour.) Even if I could cook, I still wouldn’t be able to host a barbecue as I don’t have a garden – although this will all change once I move into my dream house. It’s nice to visit a beach when the sun is shining, I find. I love being by water, whether it is a stream, a river, a waterfall, the sea, a lake or a swimming pool. This must have something to do with my astrological sign, Pisces. I’ve found a glorious bay in Anglesey, where I have to go to at least once a year – and I can feel it calling me now. I’ll be going there in the next month or so. I couldn’t say I prefer the sea to a waterfall, or a river to a stream, as they all have their own qualities. This thought reminds me of something I read in a book (I can’t remember the book at present, but when I do I will mention it on here) that says a small puddle is no less important than the ocean – they both contain the same thing – and without it we wouldn’t survive. I love the sound of a babbling brook. I like looking out to the still horizon far out to sea. I love the reflections of a mountain range into a lake. I even like the smell of freshly fallen rain. No, I definitely like water. And another good thing about water, well two things actually, is it keeps you cool on hot days like today. Drink it and run your hands under it – both have the cooling effect that is just what is needed! Well, all these thoughts of water have certainly cooled me down a little, and the temperature has increased to 26.8c in the time it has taken me to write this. I think it’s going to be hot, Hot, HOT today!